What if books want to be read as much as we want to read them? This is certainly true of our young hero in THE BOOK NO ONE EVER READ. Morry, a young book, is tired of standing still on a shelf amid dignified first editions, and yearns for the excitement of sharing his story with a child. 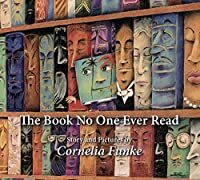 The books and illustrations within THE BOOK NO ONE EVER READ pay homage to some of Cornelia Funke's favorite authors, whose books crowd the shelves of the library the story is set in. Some of the writers included are Toni Morrison, Robert Louis Stevenson, Jane Austen, Victor Hugo, Shel Silverstein, Frank L. Baum, and many others. The inspiration for Morry is Maurice Sendak, author of WHERE THE WILD THINGS ARE.